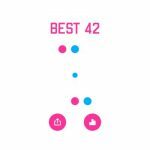 Circle Pong by App Cow is a modern-day variation of Pong, that iconic video game that took the world by storm in the ‘70s, and remains well-loved up to this very day. The game runs on iOS and Android and it is, in essence, a version of Pong that can be played by one player, with the goal being to “keep the ball bouncing inside the circle.” It’s extremely simple, as all you have to do to control your paddle’s direction is by tapping your display, and the game’s developers warn players that they may become addicted. Further, Circle Pong is described as a “mix of ping pong and squash,” which sort-of checks out. 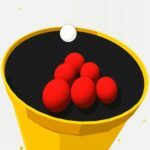 Here we’ve got five Circle Pong tips and tricks that may help you get a high score and keep that ball from bouncing away from your paddle. 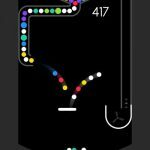 The first instinct of many players is to use just one finger to tap on the screen. That’s going to leave you frantically tapping in an effort to make sure your paddle hits the ball. What you’ll want to do instead is to have one finger on the left side of the display and another finger on the right side. This “two-finger tapping” approach will allow you to be ready in case the ball decides to take an unpredictable route around the circle, which can happen very often. Circle Pong is a very fast-paced game – we get it, and we know how quickly that ball can move around the circle. And that could lead to your fingers overcompensating and tapping too fast, and too often for comfort. Try to take a relaxed approach and have your paddle meet the ball with the minimum number of taps required. That means having the paddle go a little further than you want it to go. After that, tap lightly to gingerly reverse your course just as the ball approaches the edge of the circle. It may take some practice at first, but then again, that’s why practicing regularly is important when it comes to aiming for those high scores. In other words, don’t panic when you’ve reached a certain score! Even if you reach the hundred-point mark, neither ball nor paddle will change their speeds. 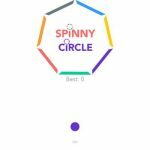 The thing with games such as Circle Pong is that losing your focus for even a split second will throw your game off and end it just like that – there are no multiple lives here, when the ball leaves the circle, that’s it. This makes it important to literally keep your eye on the ball – if it helps you, play with the sound turned off, but on the other hand, playing with sound on just may be to your benefit. Do whatever works for you, so long as it helps you remain focused.